All right, so I have never read 50 Shades of Grey, apart from an excerpt which I found to be…not my cup of tea. I have no interest in seeing the movie. And I had no interest in the cross-promotional Valentine’s Day collection by OPI. So yeah, now I have My Silk Tie, and although I usually shy away from silver polishes, this one called to me, and I daresay that I sort of like it on me. It’s warm for a silver, having a slight pewter tone. I feel this is why it doesn’t clash horribly with my skintone. The shimmer is nicely done, so it’s not frosty and streak marks are minimal. While it did have a thinner formula than I expected, it wasn’t as bad as that of the last OPI I tried. It still needed three coats to be fully opaque, but the coats went on easily and evenly. This certainly won’t be an everyday polish for me, but I think it’s nice to have the option of a silver polish. 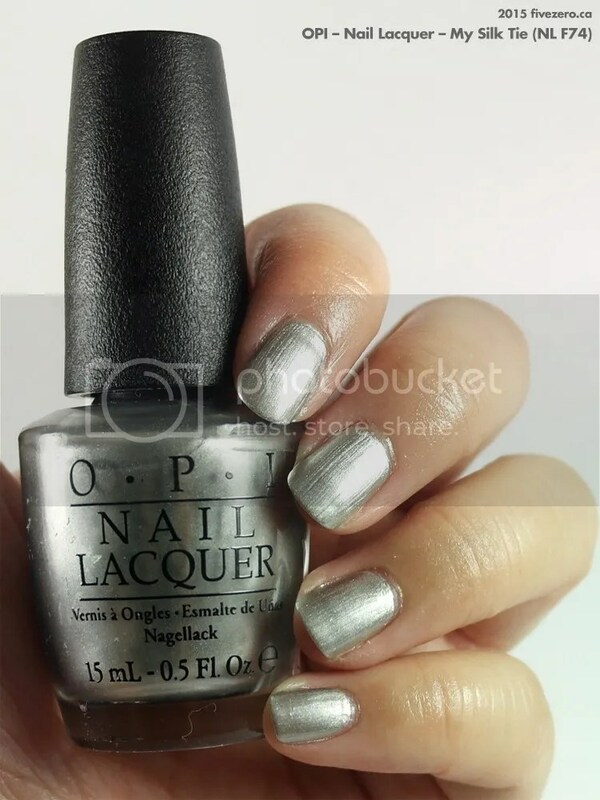 OPI Nail Lacquer retails for about US$9.50 / higher in CA$ (I see a range of prices; I purchased mine discounted at Winners for CA$7.99) and is 0.5 US fl oz / 15 mL. OPI nail polishes are free of toluene, formaldehyde, dibutyl phthalate (DBP) and camphor, and are made in the USA. OPI has been owned by global beauty company Coty Inc. since 2010. Silvers always look awesome. I did not watch the movie. And I don’t mind if I miss it. There was a light cool gray from the collection that I wanted. I don’t remember its name though. Heh, with most silvers, I feel like I have aluminum foil pasted on my nails 🙂 It actually was a pretty nice looking collection, considering it was mostly greys!